Q: We're working on training our dog not to beg at the table, but I'm a little confused about the training process. When she does stay on her mat during meal time, how and when should we praise and reward her? A: You have a couple of options to reward your pooch for staying on her mat. One option is to give her a long-lasting chew or a frozen stuffed Kong to occupy her while she lies on her mat. By placing her mat at the edge of your table, you can easily tie a rope on the inside of a Kong and attach it to the table leg (if it’s a sturdy-enough table) to keep her from pulling the Kong off her mat area. 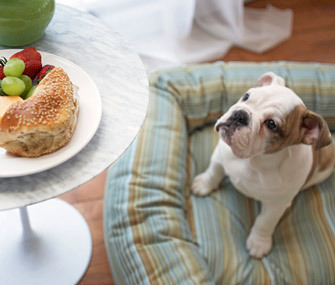 The other option, which can be combined with the long-lasting treat reward, is doling out treats for staying on the mat. Randomly place kibble or treats on her mat area while she does the down stay. Keep her guessing when the next treat might come by constantly changing how long she goes between rewards, such as switching the time between lying down and getting a treat from five seconds to 60 seconds to 20 seconds. If you’re like me and find the idea of handling dog treats during dinner unappealing, you may want to opt for less messy treats for rewarding, such as Cheerios or healthy veggie and fruit treats like blueberries or frozen green beans. You can also use the Manners Minder, which dispenses treats at the push of a button and can be placed right on the mat area. The Manners Minder includes a setting to allow for random distribution of treats on its own, which makes rewarding a down stay even easier. The more you practice, the longer time goals you can set for your dog to stay in a down stay before getting her reward; ultimately, you should work up to giving her the reward of a chew, treat or even her dinner bowl once your family’s meal has ended. If she ever gets off her mat, stop all rewards until she moves back to her mat. Never reward her when she approaches the table or does other begging behavior; this will make breaking the habit of begging more challenging. Interestingly, dogs who are rewarded for begging only once in a great while will actually be more persistent beggars when trying to break the habit than will dogs who are rewarded for begging most of the time. Watch Mikkel's video for more information on how to Teach Your Dog to Stop Begging at the Table.